Kansas forward Dedric Lawson (1) looks to drive against Northeastern forward Tomas Murphy (33) during the second half, Thursday, March 21, 2019 at Vivint Smart Homes Arena in Salt Lake City, Utah. Salt Lake City — They combined for 38 points, 14 rebounds and one big victory while helping lead No. 4 seed Kansas to Thursday’s 87-53, first-round victory over No. 13 Northeastern at Vivint Smart Home Arena. But the one statistic that made the whole thing possible may have been an assist from mom. 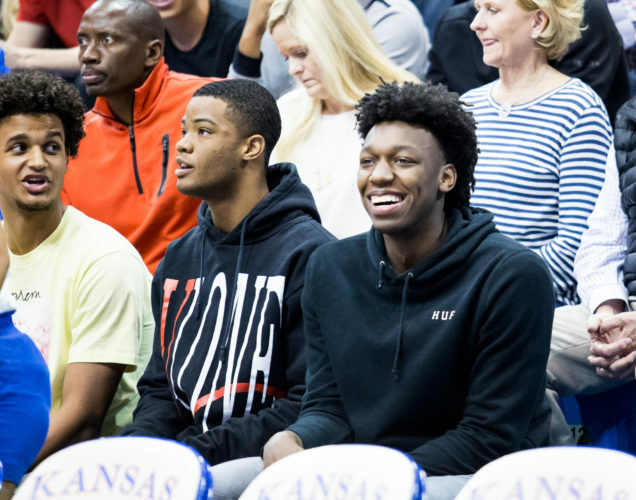 During the Lawson brothers’ brief recruitment in the spring of 2017, Dedra Lawson, sent Kansas coach Bill Self a text message that served as a simple reminder about what Self would be getting if he agreed to sign her sons. “Coach, my boys are winners,” Dedra recalled the text reading during an interview with the Journal-World. And on Thursday afternoon, the Lawson brothers became winners on the biggest stage in college basketball. Playing in the first NCAA Tournament game of their careers, against a team that Self repeatedly called dangerous and many national analysts had on their list of first-round upset specials, the Lawson brothers did what they have done the majority of their lives. They won. Big. Building a 12-point halftime lead and using a 32-6 run in the second half to run away and hide, Kansas (26-9) zapped the life out of Northeastern (23-11), which entered the game shooting 38.8 percent from 3-point range and finished the day just 6 of 28 from behind the arc (21.4 percent), with three of those makes coming in the game’s first five minutes. 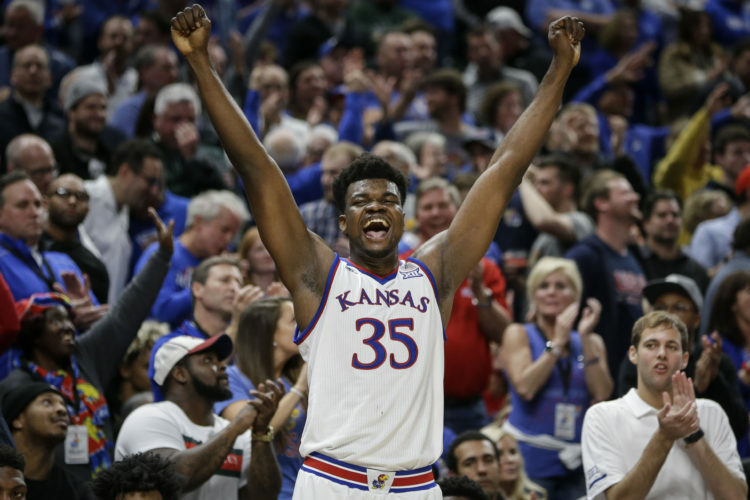 To have Dedra and their father, Keelon Lawson Sr., sitting in the front row behind the Kansas bench to see KU’s second-largest, first-round NCAA Tournament victory in the Self era (KU topped UC Davis by 38 in 2017) was merely a feel-good bonus that added to a day that won’t soon be forgotten in the Lawson household. What Dedra and Keelon saw from Dedric was something people have seen all season long. In recording his 21st double-double as a Jayhawk, Dedric was strong inside, smooth outside and effective early, scoring KU’s first 7 points to get his big day off and running. “Seeing that first shot go down, I knew it was over with then,” Dedric said. So excited was the younger of the two Lawson brothers to play in his first NCAA Tournament game, he actually altered his regular routine on Wednesday night. “I went to bed early so the morning could come faster and we could get out there and be a part of such a great opportunity,” he said. On the heels of one of his worst offensive outings of the season against Iowa State in last weekend’s Big 12 title game, Dedric scored 25 points on 9-of-16 shooting, including 3 of 5 from 3-point range, while adding 11 rebounds, three coming on the offensive end. Perhaps the most impressive part about those numbers was that they came in just 25 minutes, eight fewer than his season average. K.J.’s day landed on the opposite end of the spectrum, with the older Lawson brother playing 13 more minutes than his season average and making every one count. It was clear that K.J. belonged in that group just moments after he checked in. Although the 6-foot-8 sophomore had just 4 points in 11 minutes in the opening half, it was obvious in that stretch that K.J. 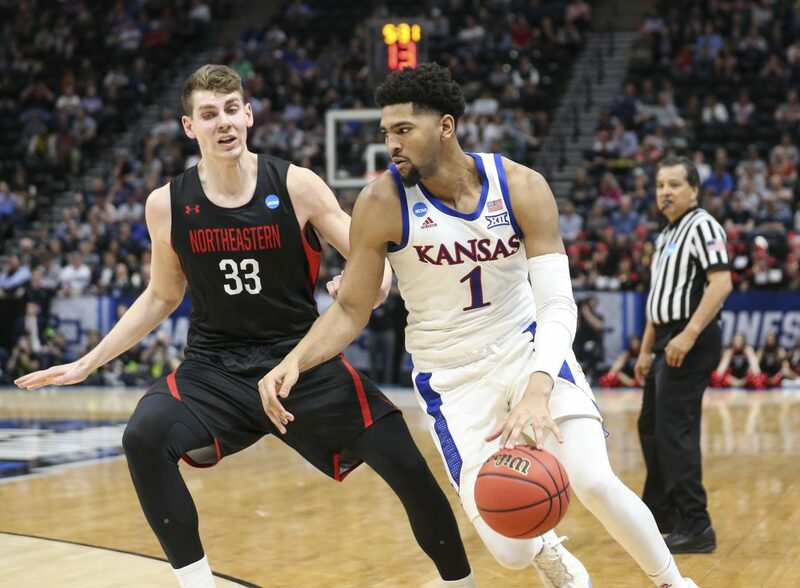 would remain a key part of KU’s plan against Northeastern and its four-guard lineup. While the Lawsons previously had combined for 25 or more points 12 times this season, most of those came with Dedric carrying the bulk of the load. On a few occasions, the duo topped 20 without K.J. even scoring. And although Thursday’s outing tied their season-high — they also combined for 38 points in a win at TCU — Dedric said after the victory that it did not feel quite like the 32 they put up in a win over Tennessee in New York or the 29 they combined for in a rematch victory over West Virginia at Allen Fieldhouse. The reason? This one came much easier. There were plenty of those types of moments — and smiles and laughter — afterwards, though. And for two players who were there every step of the way for last year’s Final Four run but could not play because of NCAA transfer rules, getting to be a real part of college basketball’s signature event was all the reward they needed, points or no points. The effort they put forth on Thursday, combined with a strong showing from their teammates, inspired Self to hand out a few compliments and ensured the Lawson brothers another taste of the tournament in Round 2. And the next 48 hours or so figure to be spent drilling home to Dedric, K.J. and their young Kansas teammates that they’ll need to approach what comes next with even greater focus.